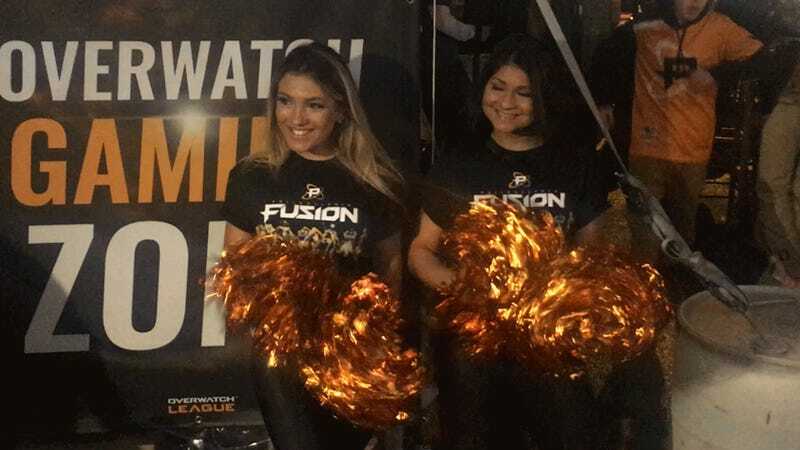 “This” is the official viewing party of the first match of the Philadelphia Fusion, the Overwatch League team owned by Comcast. I’m 34, and I’m at a college bar in West Philadelphia on a Thursday night. It’s crowded. I’m surrounded by cosplayers, cheerleaders, college kids and actual kids. I did not expect to feel old in this way. I’ve never played Overwatch before, but I played a ton of first-person shooters when I was a kid. Overwatch can’t be that much different than the first one I played (the mod for Wolfenstein 3D where Beavis and Butthead kill Barney). I’ve fallen off playing video games as I’ve gotten older, but I’m still a fan of them. I can totally get into esports. The bar is can’t-reach-the-bartender-for-a-drink packed. This makes sense. Overwatch is popular, and lots of people (cheerleaders, cosplayers, Comcast Spectacor execs) were paid to be there. But I’m surprised how intense everything is. There are spotlights. There is a line to get in. Five minutes after I arrive, fans break into a Fusion chant. The team’s players haven’t visited the city. The team doesn’t play its games in Philadelphia (all OWL games are in Los Angeles). It took its official team photo in front of the Los Angeles skyline. It pulled out of the preseason due to visa issues and hasn’t played a game yet. And yet, already there are super-fans. I only have a Wikipedia-based understanding of Overwatch. I am probably too old to become a Philadelphia Fusion fan. Still, this seems like something I would’ve really been into 20 years ago, and I want to be good sport. I’ve actually come prepared to be a Fusion fan. I watched some preseason games to try to learn how Overwatch works. I own an official team jersey, though I bought it too soon to get the version with the name and number of a player on the team. That’s too bad, because I already have a favorite player: Su-min “Sado” Kim, a South Korean who plays the tank role for the team. He was suspended before the season began for boosting, leveling up other players Overwatch accounts for money. I engaged in boosting activity on the Korean ladder during competitive seasons 4 and 5, and in doing so violated the Blizzard End User License Agreement. When I started boosting, I was not in a very good place financially or emotionally. I had just quit high school because I did not feel any satisfaction from my studies, and I felt pressure to bring in money to my family to help support them. Although I had various opportunities with some tier 2 teams in the Korean pro scene, none of those opportunities had been very promising - so I believed my chances of going pro in Overwatch were basically zero. Additionally, I had experienced a high level of throwers and trolls in my games, and that made me feel frustrated with the state of competitive overwatch. It’s a real-life instance of that old ethical dilemma: Would you boost to feed your family? I enjoy rooting for a team with a bit of scandal behind it, even if the scandal here is a violation of the Blizzard End User License Agreement. I don’t get to root on Sado tonight, but the rest of the Fusion had a good start to their first-ever Overwatch League game. On the Dorado map, the Fusion pushed the payload easily through the first two points. The ending of the first game was simple enough that even my newbie mind got it: Poko used a self-destruct ultimate to take out half of the Houston Outlaws, and the Fusion won. The place went bonkers. The process repeated itself through the next few games. I wasn’t entirely sure what was going on, but the crowd helped me figure it out. By the fourth game I was chanting Shadowburn’s name and high-fiving strangers. When the Fusion won in the deciding fifth game, someone spilled beer on me while celebrating. Fortunately, Comcast didn’t give the fans cheering instructions. As such, impromptu chants percolated through the bar. Fans cycled through several cheers throughout the night. They tried takeoffs on the Flyers (“Let’s go Fusion,” clap clap, clap-clap-clap) and Eagles (“F-U-S-I-O-N, Fusion!”) and also chanted “Fusion” over and over and over. The Philadelphia Fusion don’t play in Philadelphia. If Overwatch League isn’t a success, they may never play in the city. But they have a fanbase who will show up at a bar to cheer them on and a 1-0 record, which is a start.